In a mortar and pestle, finely grind the sea salt into a fine powder. Snip the dried persimmons in 3/4-inch dice with kitchen shears. Remove and discard the stems. Place the raisins in a small stainless steel bowl. Pour a hot cup of white tea over the raisins. Soak the raisins for at least 30 minutes. Drain all the liquid and reserve about 2/3 cup of it. Set the raisins aside. Peel, core and dice the pineapple (see tips). In a small saucepan, add the reserved white tea, pineapple juice, brown sugar, cinnamon, licorice, star anise, candied ginger, lemon zest, basil and mint. Bring to a full boil and cook for about 2 minutes; the brown sugar should be fully incorporated. Turn off the burner. Add the marmalade and the brandy extract (if used). Stir well. 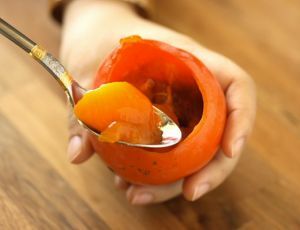 Place the diced persimmons and the pineapple cubes with lemon juice in a bowl. Add the syrup. Toss until the pineapple and persimmons are nicely coated with syrup. Drizzle with honey. Finish with the raisins. Check the sweetness of the compote and add more honey if necessary. Remove and discard the basil and mint. Assemble when you're ready to serve. 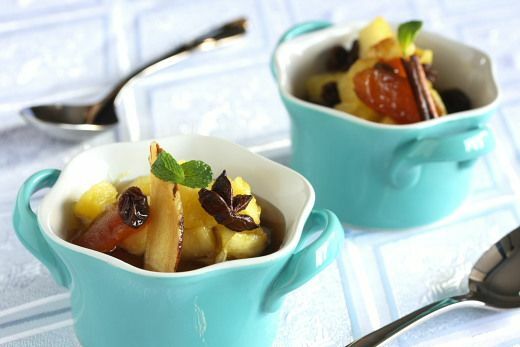 Serve the warm persimmon pineapple compote in small bowls. If you don't mind the calories, you could top the dessert with a dollop of crème fraîche and slightly toasted candied almond slivers. In a small pan, dry toast the almonds for about 2 minutes with 2 teaspoons of sugar until slightly golden and coated in sugar. Transfer to a plate to prevent the nuts from turning more golden (or burning!). I used pineapple juice but you can use any other juices and fruits you have on hand. All the spices can be found in most Asian stores. I usually buy raisins in Middle Eastern or Indian markets; dried fruits there are a lot more moist than at most regular chain stores. They also make a great snack. 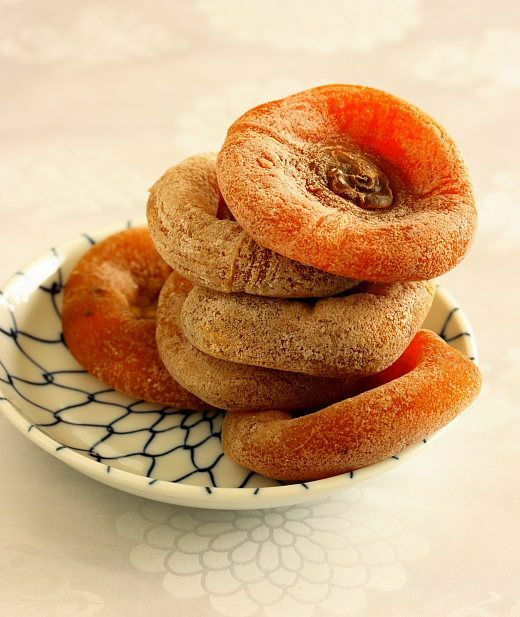 A lot of Asian stores in the Bay Area carry superb dried persimmons this season. They're sold in 1-pound packages (6 dried persimmons per pound). They are incredibly sweet, still moist, full of fiber and delicious. They're a great, healthy snack and are a refreshing alternative to more commonly found dried fruits such as dates, prunes, raisins and dried apricots. How to cut a pineapple: Pineapple is very common in Asian cuisine, both in savory (such as canh chua Vietnamese fish soup or Sweet and Sour Tofu) and sweet dishes. Maman taught me at early age how to cut a pineapple. There is a way to slice a pineapple without "wasting" it, as Maman would say. First, the most important part is to use a very sharp chef's knife. Remove and discard the crown and cut off the base of the pineapple. Place the pineapple upright, then strip the skin off. The peel shouldn't be too thick; you should still be able to see the eyes of the fruit. 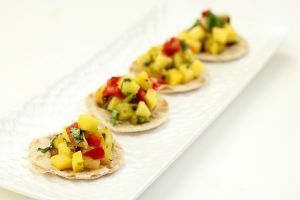 Remove the eyes of the fruit 2 by 2 diagonally all around the pineapple, creating several spirals. Quickly rinse the fruit under running water to remove any of the peel. Horizontally slice the fruit into 1-1/2 inch disks. Voilà! You'll never buy canned pineapple again . I used white tea because of its subtle flavor and sweetness. I used Frutto Bianco Pearls White Tea. Green tea would have been a little too strong with a "grassy" flavor. I think white tea pairs wonderfully with pineapple. I buy this particular tea at Teavana in the Stanford Shopping Center, in Palo Alto, California. 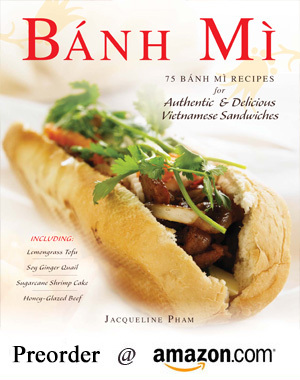 Published By: Jacqueline Pham on February 4, 2010. We all do too. There are 2 teenagers in the house. One of them is in love with Shawn and the other one's in love with Gus and they have arguments about it! 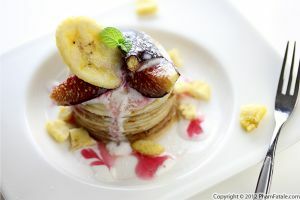 That is a beautiful dessert dish!! beautiful colours and gorgeous fotographh Jackie! M lOVING it!